Middle School STEM Meets HPC. Could a facility like the MGHPCC have a role in K-12 education? That is the question that a team from UMass Amherst, MIT and the Holyoke and Springfield middle schools have been investigating. Supported by a joint MIT and UMass Amherst grant from NSF, the so-called CI-Team project developed an online module for a middle-school Earth science review class about convection and weather. The thrust of the CI-Team project is creating virtual interactive textbooks (VITs) that can be used to enhance STEM teaching. Like the fictional Daily Prophet in the world of J.K Rowling’s Harry Potter or Douglas Adams’ fabled Hitchhikers Guide to the Galaxy, a VIT aims to engage its reader by providing content that is highly interactive. For STEM teaching it is an interesting concept, that can help bridge between abstracted theory and the real world — illustrating science and mathematics to students as ways to understand their world. In the CI-Team project a VIT is being developed that targets the middle school Earth science curriculum. The CI-Team project VIT allows students to carry out virtual laboratory experiments using numerical simulation codes that require substantial computing resources. To service this need a big HPC facility, like the MGHPCC, is seamlessly and transparently accessed from the VIT. 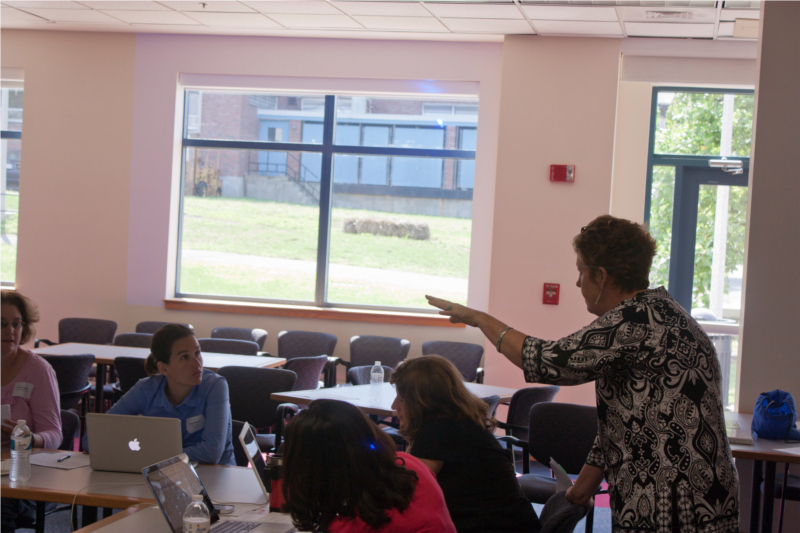 The project team hosted a one-day workshop on August 16th, describing the project goals and development to a group of educators from local schools and community organizations. The heart of the project is a pilot study which experimented with how a research simulation code, running on an on-demand high-performance computing system, might be integrated into an online teaching module. Educators attending the workshop tried out the experimental module developed by the team. The module combines (1) a pre- and post-test evaluation component, (2) a series of online chapters that present phenomena and prompt students to reason about what processes are at play and (3) an interactive laboratory experiment simulation that permits students to test hypotheses developed by the class. The elements (1), (2) and (3) were integrated within the UMass online, web-based learning system OWLbook. The OWLbook system provided a way to package together the different elements to produce a smoothly flowing lesson in which remote high-performance computing is employed in a transparent manner. Results from pilot study classroom field tests, in which the experimental module was used for a lesson in four middle schools, were presented too. The results included both quantitative measures of whether the student test scores improved and qualitative measures of student engagement. Histogram plots showing the distribution of students across a test with a score range of 0-8. 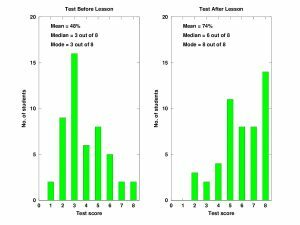 The left plot shows the distribution for a test given prior to the field test lesson. 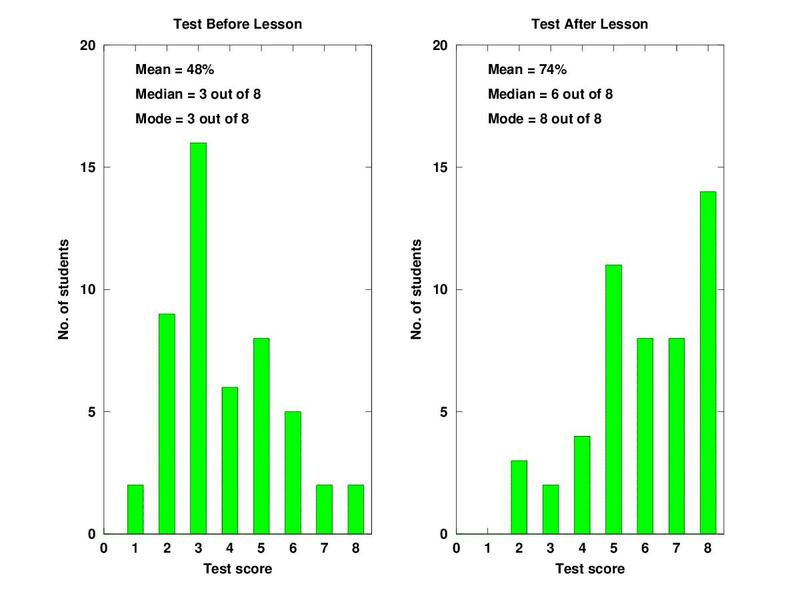 The right plot shows the distribution of scores amongst students for a test given after the field test lesson. The quantitative measures were used to establish that the module had engaged students, measuring improvements in their understanding of the lesson topic. Overall the quantitative scores across the four classes rose noticeably, suggesting that most students were engaged and stayed focused on the lesson topic. There were some individual students whose understanding was not improved. The overall average score for all students rose from 48% to 78%. The median score for students was 3 out of 8 before the lesson and 6 out of 8 after the lesson. In the before lesson test the most common score (the mode) was 3 out of 8 correct answers. After the class, 8 out of 8 correct answers was the most common score. The OWLbook system provides digital access to test scores, so that lesson impacts for a class or for an individual student can be assessed and addressed as needed. As noted, not every student improved their scores and OWLbook captures the information needed to see this rapidly. Qualitative measures were garnered from questionnaires and from video recordings made during the classroom lesson. The results of these clearly reflected student engagement, interest and enthusiasm. The teachers whose classes participated in this work all noted that the approach seemed to get and hold their students’ attention. 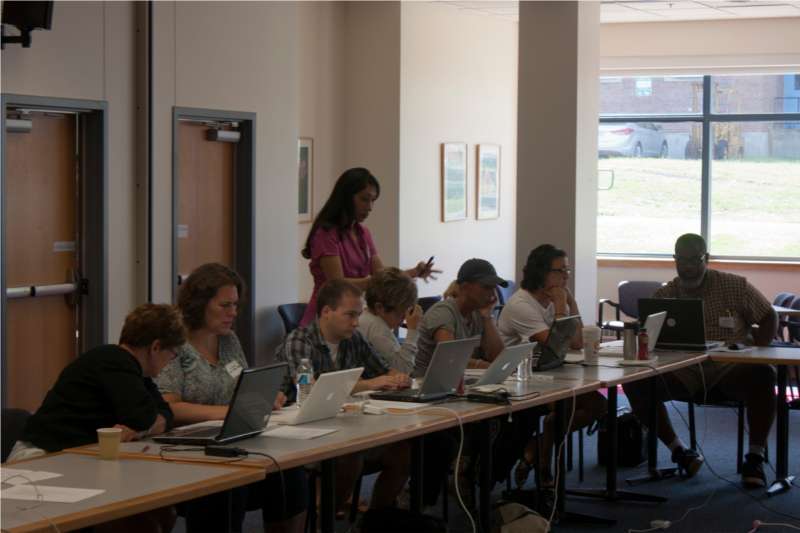 The CI Team researchers are currently analyzing their field test results and formulating refinements to the system. There are interesting opportunities for the development of more Earth science modules. Further opportunities are also apparent around differentiated learning and around providing high-end simulation for informal learning settings that employ hand-held devices with limited computing power. This modest scale pilot study did not extend to a more complete experiment involving control classes that did not use the OWLbook module. Work toward a more comprehensive experimental assessment is being planned. And one day, as tablets and handheld devices proliferate, maybe some of the fictional “wizardry” from the worlds J.K Rowling and Douglas Adams will start to become everyday reality in Massachusetts classrooms.